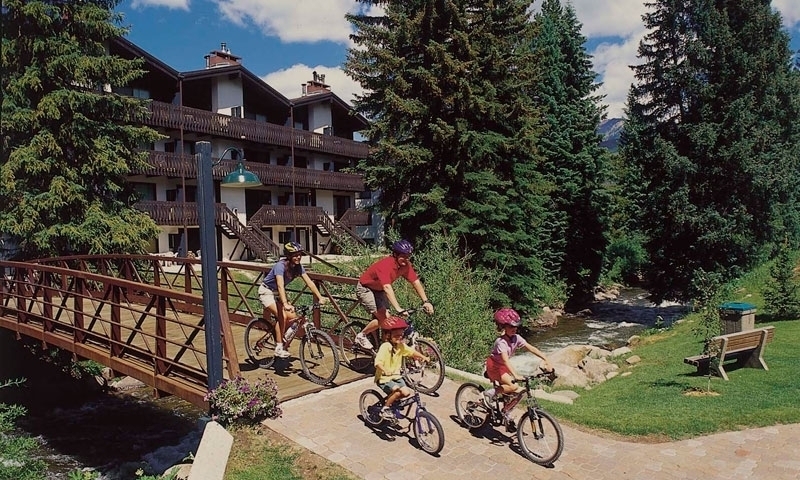 The Vail Recreation Path is an affordable way to have fun with your entire family. Located right in the middle of town, the trail winds from Vail Village to East Vail, parallel to the Vail golf course. Vail Recreation Paths are a great way to explore the beautiful Colorado landscape on 15 miles of maintained trails. The paths are perfect for recreation such as hiking and mountain-biking and you can visit the highest botanical gardens in the world. Use of the paths is completely free! Located right in the center of Vail Village, Vail Recreation Paths, provide excellent trails for exploring the area. The paths are surrounded by 35,000 acres of national forest, as well as 5,289 skiable acres and are located on one of the largest mountains in the world. Enjoy 15 miles of Vail's most glorious scenery. The Paths begin in Vail Village, Colorado which is 100 miles west of Denver. The paths begin in the center of the village and make their way to East Vail opposite the Golf Course. The surrounding countryside around the paths are beautiful winter and summer although weather restrictions apply during extreme conditions. Apart from enjoying a pleasant stroll and observing the amazing views there is plenty more to do in the area. The expanse of the paths also includes the highest botanical gardens in the world, which are well worth a visit, and the majestic outdoor amphitheater. The paths are also great for mountain-biking and there are plenty of rental shops in Vail Village.